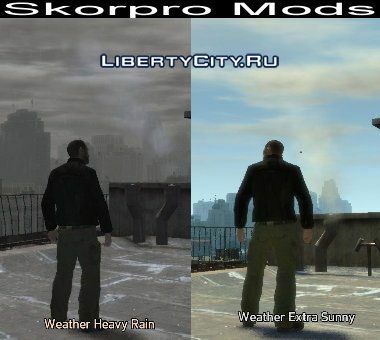 The script modification allows you to switch between 8 types of weather. This modification replaces many trees, on high-quality palm trees, than does GTA IV a bit like Los-Angeles. The game looks great, I advise everyone. Everyone wanted him so much in GTA IV. Get it. The mod was made already in 2012, but it was not on the site. Of course, not the same as in GTA San Andreas, but also not bad. The instruction is inside the archive. Have a good game!